It took Lucy, a 5-year-old Chihuahua mix, a little while to get used to her family’s new dog, Dylan, with all his boundless puppy enthusiasm. It wasn’t just his energy; it was his sheer size. Dylan is a Mastiff/Labrador Retriever mix and, at three months, already weighed 28 pounds. He dwarfed little Lucy. But Dylan has won Lucy over and the two are inseparable, according to Susan Boyer of Staten Island, NY. Dylan snoozes after some energetic puppy play. She adopted him after seeing him on Petfinder. 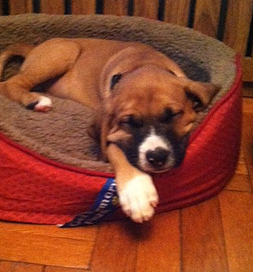 He was in foster care with Traveling Paws, a foster-based all-volunteer group in Cranford, NJ. “He is the sweetest boy ever – just wants to play and kiss you and love you and be loved,” she says. “He already knows sit, lie down and stay. He fetches his toys and brings them back if you have a treat waiting for him.” And he’s already house trained, which is a real bonus. Susan says Dylan has completed their family, which includes her and her two teenage daughters – and, of course, 5-year-old Lucy, also a rescue. Love conquers all, even little Lucy.